In remote Northwest Colorado hides a community of a couple thousand people. A town centered on a ranch lifestyle and a beautiful river. The place is Meeker, Colorado. The trout-filled White River flows through town and Northwest Colorado’s only historic hotel sits on Main Street, its brick façade concealing memorable Old West stories. Footsteps echo off the lobby’s hardwood floor and the hand stitched leather chairs and custom forged wood burning stove beckonweary travelers. The walls are covered in biographies and pictures documenting stories of past guests, including Teddy Roosevelt. And looking down on all this, are the world-renowned massive elk and mule deer trophies, many of which have graced the lobby for over a hundred years. 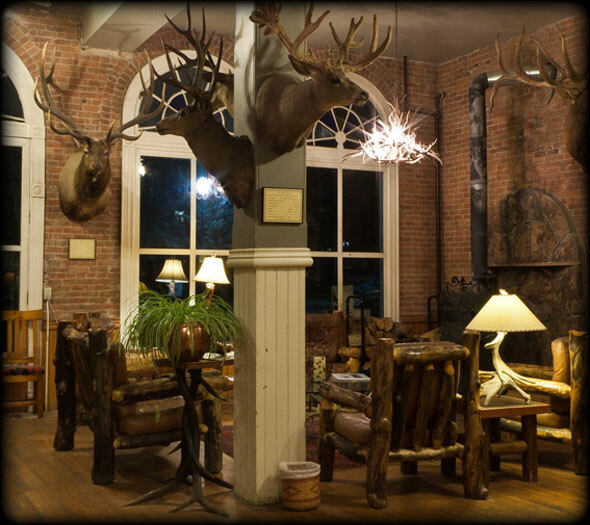 If you are drawn to off-the- beaten path locations, natural outdoor beauty and old west history, then the Meeker Hotel is a perfect choice. Our fourteen custom rooms insure that our guests will enjoy a unique stay every time they visit and our full service restaurant and bar provides a fun stop to enjoy a breakfast, lunch or dinner. We look forward to sharing this wonderful building and its rich history.